As your insurance agent, our objective is to professionally serve your insurance needs. We recognize that in providing these services, we have an obligation to safeguard the personal information you entrust to us as well as other information we may collect in the process of servicing your insurance needs. This notice describes the privacy practices and standard we adopted to protect and ensure the confidentiality of your non-public personal information. We do not sell or market your non-public personal information. 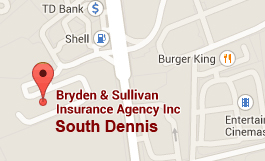 All Bryden & Sullivan offices listed below adhere to these practices and standards. 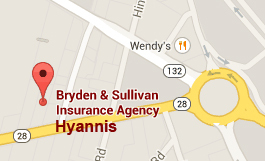 Bryden & Sullivan Insurance Agency, Inc.
Bryden & Sullivan Insurance Agency of Dennis, Inc.
You provide most of your non-public personal information on your applications for insurance or other forms. Depending on the type of insurance policy you request, we may seek additional information about you or other individuals who are being proposed for coverage under the policy. In certain circumstances, we may collect information about you from third parties. For example, for automobile insurance we may seek driver information from the state motor vehicle department; for property insurance we may send someone to inspect the property. The information we collect allows us to properly process your applications for insurance or report and service your claims and to complete the other transactions incidental to your insurance policy. We do not disclose any non-public information about you or about participants or claimants under your insurance policy to anyone, except as permitted by law. We may share information about you or about participants or claimants under your insurance policy in the normal business of conducting insurance operations, such as with your insurance company (or companies to which we are applying for insurance on your behalf); appraisers and independent adjusters who investigate, defend or settle your claims; insurance regulators and your mortgage lender or lienholder. We restrict access to nonpublic personal information about your or about participants and claimants under your insurance policy to those employees who need to know that information in order to provide products or services to you. We maintain physical, electronic, and procedural safeguards that comply with federal regulations to guard your nonpublic personal information. If your insurance policy has been cancelled or non-renewed, this policy notice does not reinstate that policy. This notice should not be accepted by anyone as evidence that insurance coverage is in force. These privacy practices and standard have been put in place to protect your personal information. You will receive a reaffirmation of our privacy practices annually.